A team of runners/walkers from Brydon, Swearengen & England P.C. 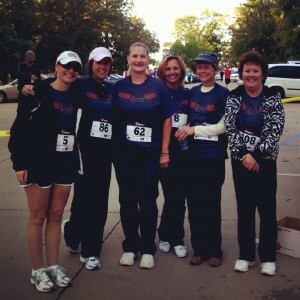 participated in the Zonta Club of Jefferson City Foundation Fifth Annual 5k Run/Walk on September 22, 2012. BSE employees participating were Cathy Backes, Susan Bates, Karen Borgmeyer, Pat Hulse, Jodee Mitchell, Lori Rackers and Zonta Member Erin Wiseman . Ms. Wiseman chaired the public relations committee for the Zonta 5k. The Zonta Club of Jefferson City Foundation hosts the Annual 5k Run/Walk each year to support and benefit women’s causes around the globe with proceeds going to Zonta International Foundation. The Zonta International Foundation supports programs that make a difference in the lives of women in more than 75 countries.